If you're an experienced Christmas Enthusiast, then you probably already know exactly what you're going to do for this year's Christmas light display. You've likely decided about the lights you'll be installing, and where you'll be installing them. But if you're a newbie Christmas Enthusiast, you probably don't have it all planned out. You probably don't know which lights to buy, or where to install them. Or maybe even how to install them. No need to worry, though. That's what planning is for. And right now is the perfect time to do your planning for this year's Christmas light display. Here are 3 action steps to guide you through the process of planning this year's Christmas light display for your home, along with lots of links to more detailed information. Yes, it's the 'B' word. But it's important. Christmas, after all, is a 'spendy' time of year. Household budgets typically become rather strained during the holiday season. So before you start spending on Christmas lights and décor, it would be wise to determine how much you can comfortably afford to spend. 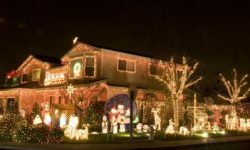 Once you've made that determination, you can set that amount of money aside, and go on a Christmas light buying spree to your heart's content - and to your budgeted limitations, of course. Now that you know how much you can spend, you'll need to decide what to spend it on. 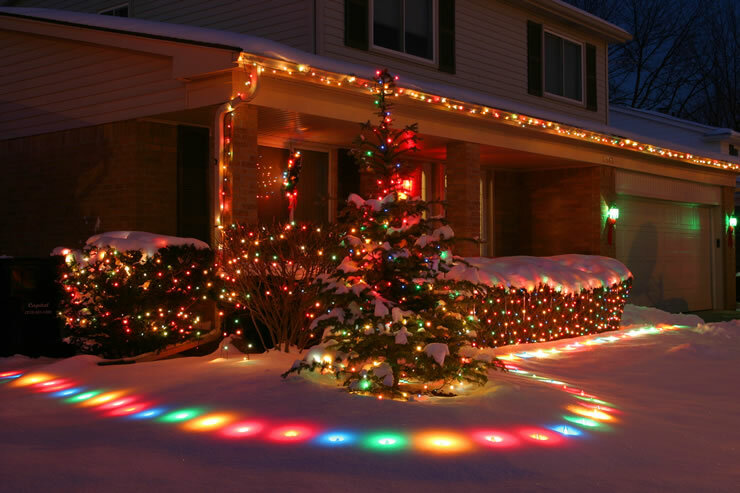 Start by determining what direction you really want to go with your light display. 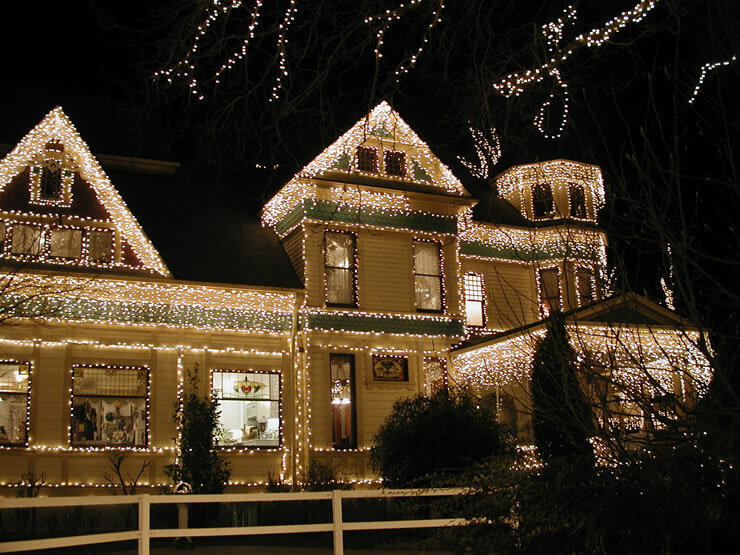 Will your light display focus upon just your house? Will it cover the entire house, or just highlight certain areas? Consider all these questions to determine where you'll be installing lights, how many lights, and the types of lights you'll be using. Before you purchase your lights, carefully consider the type of light lines you'll be using. You'd be very wise to go with empty socket light lines. You should also consider how much electricity your planned display will require. Installing a Christmas display requires more than just lights, of course. 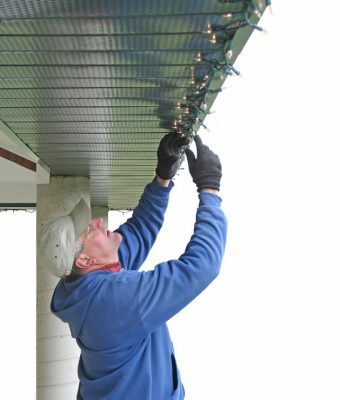 You'll also need some hardware and specialized supplies for hanging those lights safely and professionally. Clips and Attachment Accessories: No matter the type of surface to which you might be planning to attach lights, there's a purpose-made attachment device perfect for the situation. So as part of your planning process you'll be wise to evaluate your needs, determine the best attachment supplies for your situation, and order accordingly. Hardware and Miscellaneous Supplies: Will you need tie wraps? Electrical tape? Staples? Try to anticipate everything you'll need during the installation process. And order in advance so that the lack of supplies doesn't derail your Christmas light installation process. Electrical Equipment: Do you have plenty of extension cords on hand? You'll also want to make certain that the cords you're planning to use are in good condition. This is also the time to determine whether you'll be using timers. When planning your Christmas décor, just remember that great Christmas displays aren't all about lights - at least not exclusively. Adding some holiday greenery can do much to elevate your Christmas display to a higher level. And adding some nontraditional lights to the mix can do the same. Specialty lights like snowfall tubes, for example, can help you to create a dramatically distinctive look. For Christmas Enthusiasts, just about everything having to do with Christmas is fun. And that includes putting up light displays. For many Christmas Enthusiasts, in fact, installing their Christmas lights is one of the most enjoyable of Christmas activities. And that's why planning your lighting program is important. It helps to assure that all goes smoothly during the installation process. It helps to assure that nothing spoils the fun. But don't think of the planning as a dull, tedious chore. It's anything but! It's an opportunity to dream and plan and scheme - sort of like a gardening enthusiast pouring over seed catalogs in the dead of winter. So in essence, planning the Christmas lighting program for your home will be your first fun of this next holiday season. Let the fun begin!